After 10 years, Monica Webb shatters the semifinal barrier for first WPBA title. For the consistently excellent Webb (center), the victory at the Tour Championships was 10 years in the making. The full weight of pocketing that final 9 ball didn't sink into Monica Webb's psyche for a minute or two. In fact, as the crowd roared and shutterbugs flashed, Webb practically floated over to her opponent, Kelly Fisher, for a quick congratulatory clinch. She turned to find Helena Thornfeldt - her best friend for more than a decade - and saw tears streaming down her face. Jeanette Lee descended with an ESPN microphone and camera in tow for an interview, and even the Black Widow was sobbing. And then the straight-jacketed, single-minded focus that comes with competition began to fall away in Webb's mind, and reality set in. "That is when I realized that it's over with. All the pressure of winning a tournament and the stigma are gone. I started crying, and it was awesome." 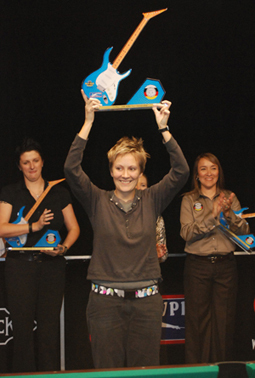 After 10 years of being the most consistent American on the Women's Professional Billiard Association's Classic Tour - and 10 years of being known as the best player to have never taken home a title - Webb finally won the big one. First, she set a personal best by making it to the final of the WPBA Tour Championships, held Nov. 13-16 at the Seminole Hard Rock Casino in Hollywood, Fla. Then she staged a hot-shooting and cold-blooded comeback against Fisher, the tour's No. 1 player, to win her first Classic Tour trophy, 7-4. "I had spent a lot of time in the semifinal TV matches getting third, third, third, thirds," said the freewheeling and spirited Webb, who often would seem inhibited and cautious while playing in front of the ESPN cameras. The persistent questions about when she would finally snap off a title were a further burden. But no longer. "I was so stressed out for such a long time, and it seems like everything is OK now," she said. "It's a like a ton of bricks off my shoulders now."